This page calls attention to the recreational aspect that once existed on this section the river prior to its drowning by the abandoned Ohio Edison dam (built in 1912). Some photos displayed here prior to that time are believed to be portions of the river as it once existed before its damming. The white water features drowned out by the dam pool were determined through the process of elimination by comparing to rapids currently existing on the river (Upper/Lower gorge). The middle gorge, AKA virtual gorge since it is gorged with water by the abandoned Ohio Edison dam, is defined here by the end of the Upper Gorge at the upstream end of the dam pool created by the abandoned Ohio Edison dam. Conveniently, Anchor rock rests essentially at this position. The section ends and transitions to the Lower Gorge at the last drop of the Big Falls of the Cuyahoga. The abandoned Ohio Edison dam was built on the upper portion of the Big Falls. Estimates for section length and gradient were determined by a combination of actual measurements with a barometric altimeter equipped GPS, and review of topographical map software (Delorme TopoUSA, v. 6.0, Magellan MapSend Topo 3D USA, v. 1.00). A virtual whitewater trip down the middle gorge can currently be experienced as a real flat-water paddle. Metro Parks of Summit Country requires a permit see kayaking permit link for access to the river (canoeing can also be written in). Front street bridge. Parking is available at the High bridge trail head, just south of both the river and bridge. Downstream (west) of the bridge is the 60 ft abandoned Ohio Edison dam. Metro Parks provides a Gorge park web page and trail map. STAY AWAY FROM THE ABANDONED OHIO EDISON DAM! RUNNING IT WILL KILL YOU! One method to run the middle gorge (with the exception of the abandoned Ohio Edison dam) is to simply continue from the upper gorge section. For those interested in starting from Anchor rock, the next best thing is to paddle up the dam pool from the Front Street bridge (currently this is a flat-water/virtual whitewater experience until the dam comes down, or a life ending experience if you drop over the 60 ft abandoned Ohio Edison dam, if the fall doesn’t get you the baffle blocks below it will). Alternative put-ins / take-outs will be added following removal of the abandoned Ohio Edison dam. Along the river left from Anchor rock to the abandoned Ohio Edison power plant (~0.8 mile) are the well preserved ruins of the Chuckery run completed and abandoned in 1844 (there seems to be a theme of abandonment here). The ruins are easily spotted today see "Chuckery" for more links. It was a project to divert water from the river to a proposed industrial city (Summit City). However, the project literally didn’t hold water. The abandoned Ohio Edison powerhouse (built in 1945) is located on the river left about 0.8 mile downstream from Anchor Rock, and visible from the Front Street Bridge. It was a larger annex to the original powerhouse built in 1912. 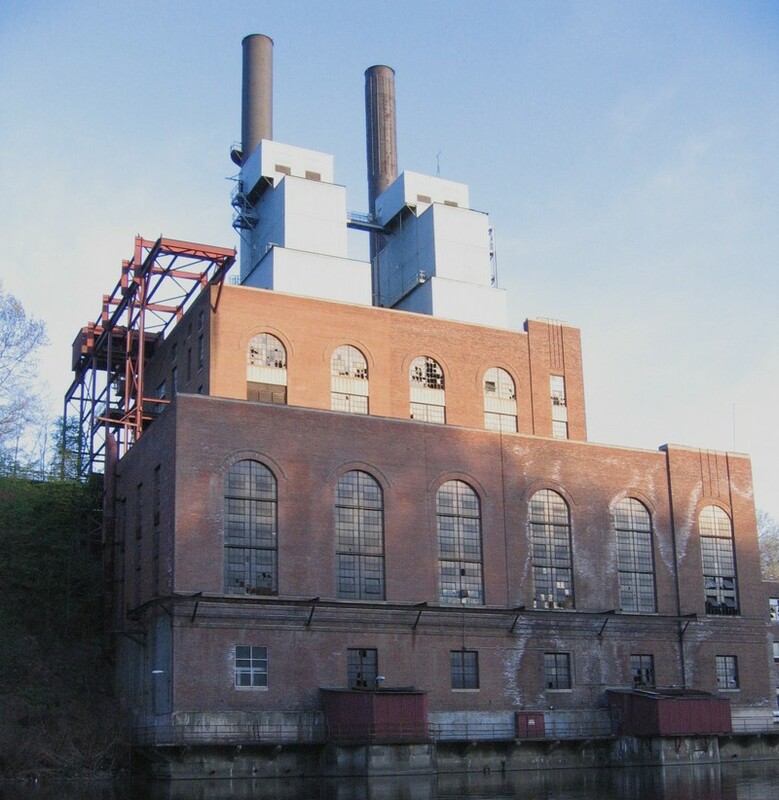 The original power house was demolished by 1965. It is not known if the demolition debris was removed or simply dumped in the river. The dam pool provided a water supply for the coal fired powerhouse, and a hydroelectric plant downstream from the dam (Blower, J.M., Korach, R.S. The NOT&L Story, p. 114. Fox Valley Printing Co., S. Elgin, IL, 1966). Flow recommendations are unknown, and historic flow parameters for paddling are unlikely to be located since the Native Americans portaged the Gorge, and the European settlers were preoccupied with other endeavors. All rapids have been washed out / flooded out for over 90 years. Current section is up to 60 feet or more under water. Thus this section will always be listed high, so long as the abandoned Ohio Edison dam stands. Flow recommendations will be updated upon its removal. The Cuyahoga River, the river that burned, played a pivotal role in the birth of the nation's river conservation movement. While restoration gains have been significant, a proposal for a new hydropower project on a dam targeted for removal would represent a signficant setback in ongoing restoration efforts and would delay for at least half a century any effort to bring back the lost whitewater that sits buried behind the Ohio Edison Gorge Dam. Paddler participation at upcoming scoping meetings is important.